A view from Scout’s deck at sunset. A storm is on the way. 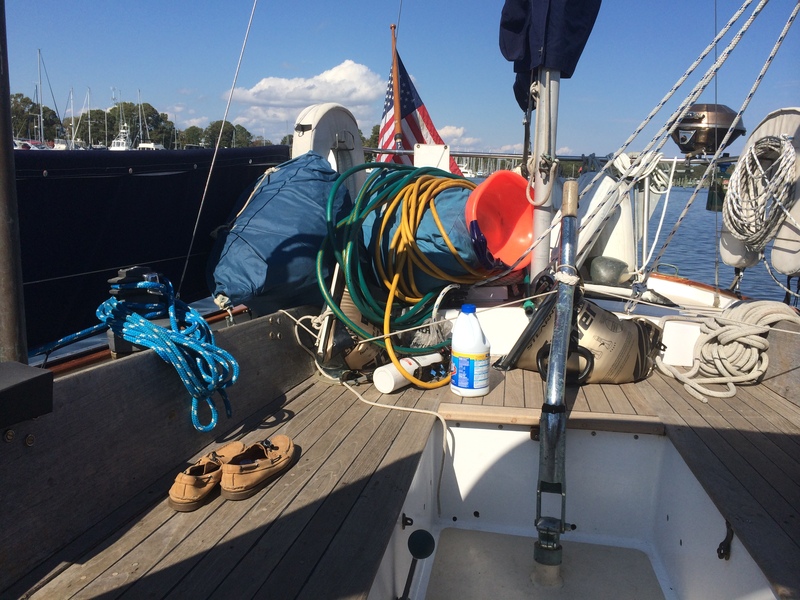 We arrived in the Solomon Island, MD on Sunday night after a very long sail from St. Michaels. It was extremely windy, big waves, and just a long day. 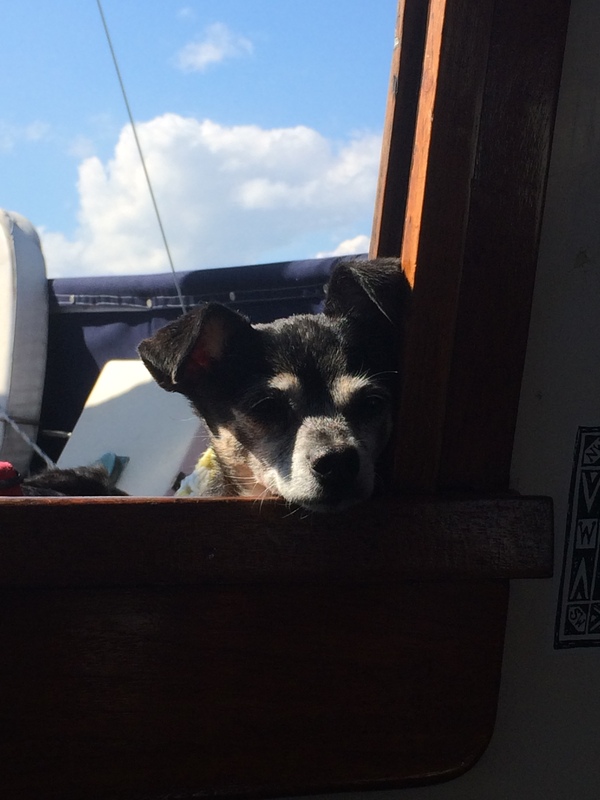 We sailed 49 nautical miles in a little over 10 1/2 hours. Scout’s anchor was finally dropped as the sun set. With that day done, we had a great dinner and early to bed. The decision had already been made to stay in Solomon for a day or 2 so there was no rush to create a route for the next day. Yesterday was a gorgeous sunny day. It was a day for chores, yes chores! 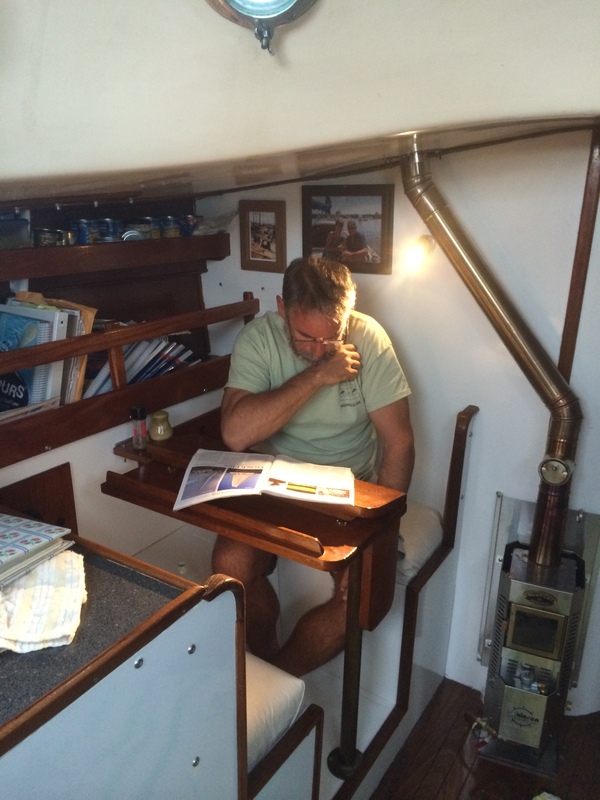 There is always something that needs to be done, but only on a down day from sailing. First and foremost, we needed the basics: Trash disposal, shower, and provisions. The first 2 were a simple dinghy ride to Zahniser’s Yachting Center. They were very gracious and provided a nice hot shower for $3, great deal. The grocery shopping still required a 4 mile walk round trip, but not a big deal, good exercise. There is also a West Marine a short walk from the marina as well. 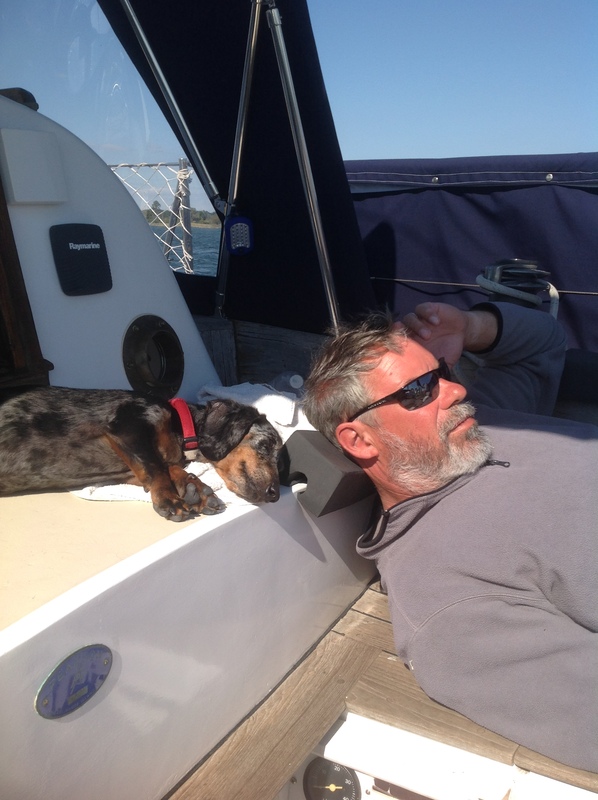 But when we got back to the boat and the dogs had a good walk ashore, it was time to get a few things done on the boat. 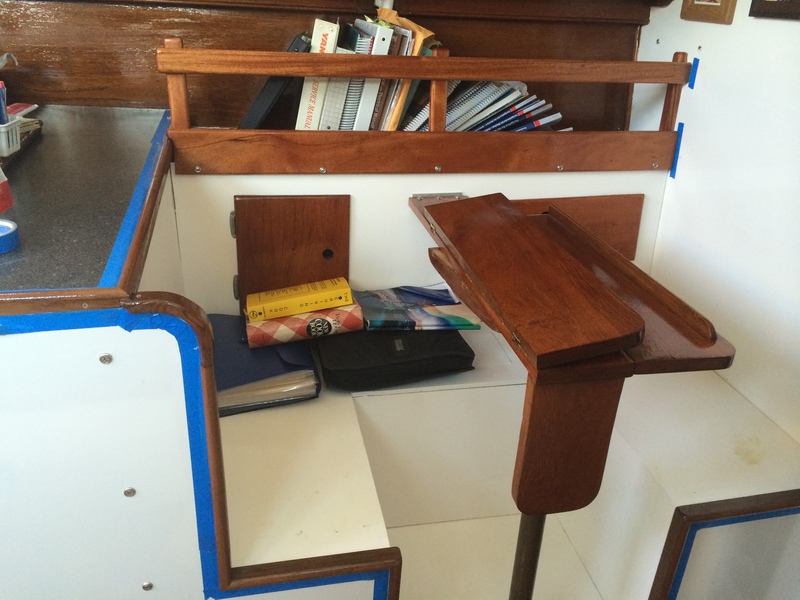 First and foremost was that the book shelf and the trim around the dinette needed a coat of varnish. It is not always an easy thing to varnish on the hook, but we needed to start the generator to vacuum up the sanding dust. The good news is a coat was done in short order, but at some point, I still need to put on 2 more coats. Brian had his own chores to work on as well. 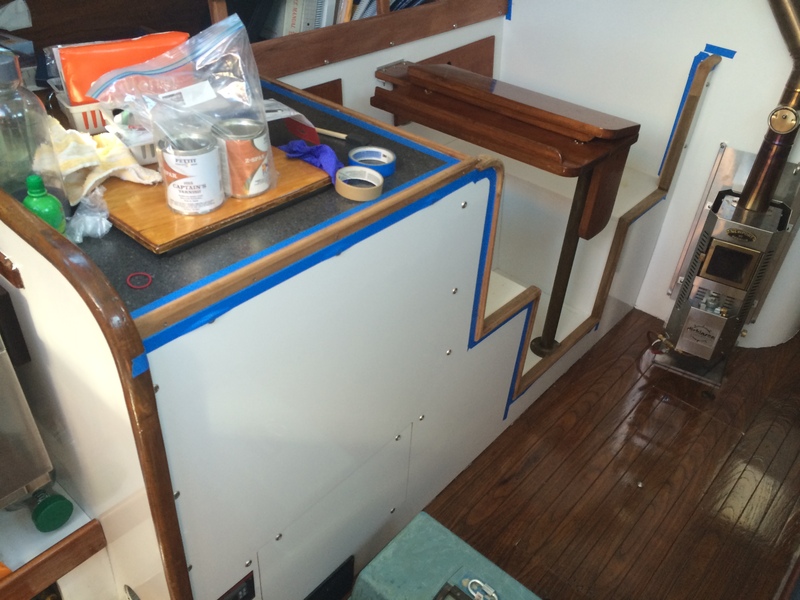 Some adjustments to the bow anchor roller, installing the fire extinguisher in the cockpit, and attaching the fender board to the stays, and the spinnaker pole was attached to the bow pulpit and stanchions. The fender board then becomes the attachment for the additional cans of diesel fuel. The fender board with the diesel cans attached. 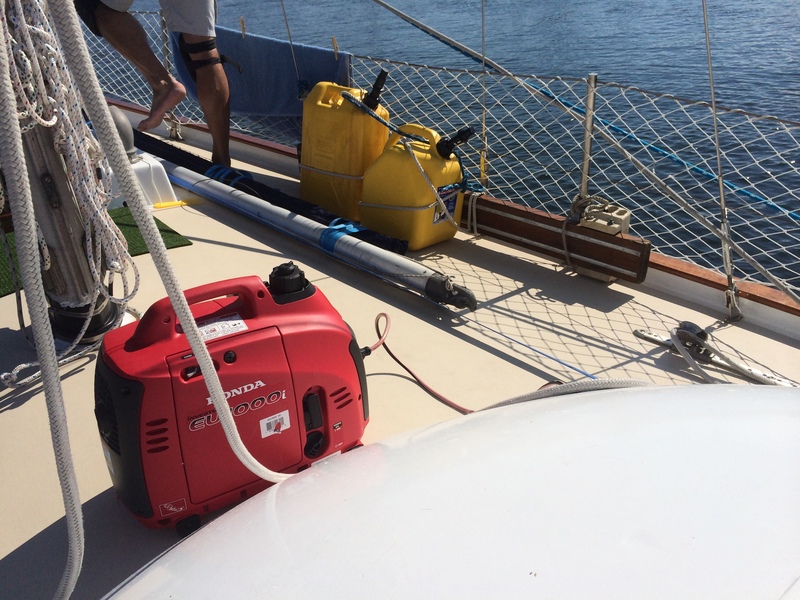 Also, a great picture of our Honda Generator, at the moment the only way we can charge our laptop. Another view of the dinette and bookshelf awaiting a coat of varnish. The dinette and bookshelf taped off and ready for a coat of varnish. And of course, there was time later in the afternoon for some sun and nap time! Today, however, is very windy and rainy. Yes, we are in the middle of a nor’easter. We have reanchored this morning to give us a better hold in the gale forecasted winds for today and tonight. This is definitely a down day for us. A great breakfast to start with, I have the bread dough rising, and I am attempting to use the pressure cooker today to make chicken soup. Brian was the chef this morning and now he is catching up on some reading. No other big plans at this point, maybe a nap and a good book! Brian spending a rainy day reading. Based on the forecast, it looks like we are here until Friday morning, then on to Tangier Island. 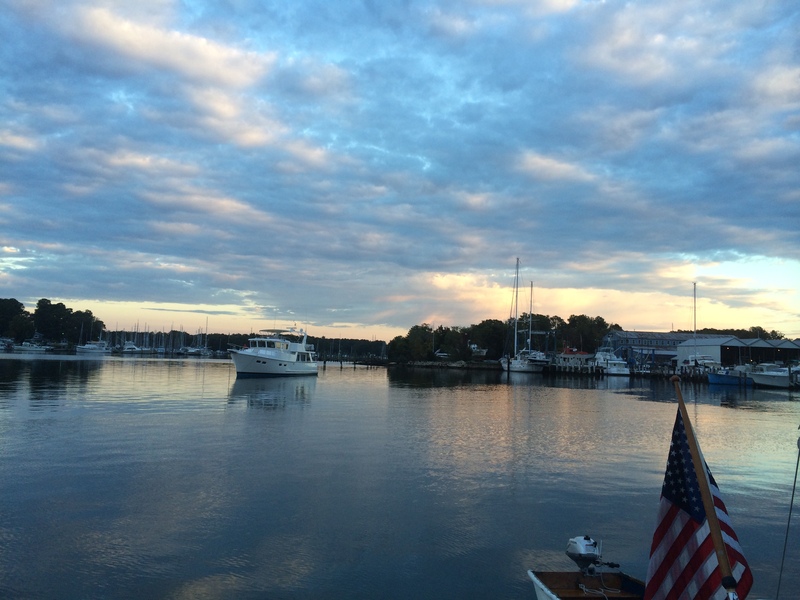 We do need to be in Hampton, VA on Tuesday, October 28th to meet up with the Snowbird Rally. This rally is sponsored by Sail Magazine and will be our traveling companions to Miami in December. It is still fun, scary, exciting, frustrating, amazing, and everything else I am not sure I can put into words. I am still amazed we have this opportunity to follow. We love hearing from you guys. It gives us inspiration. Always good to know you are safe and traveling well. We look forward to hearing how you guys are doing every day. Smooth sailing. Ps. We are trying to get Mike on Facebook. Getting Mike on Facebook would be great! But I think that will be an up hill battle!